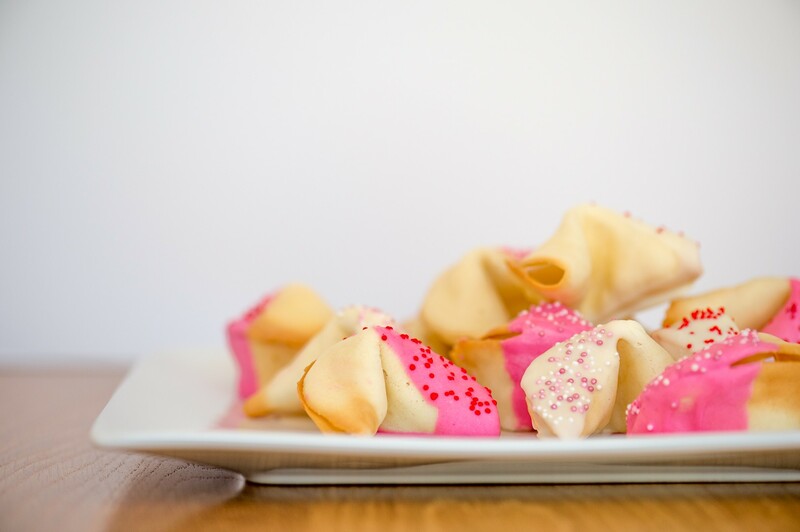 I had a lot of fun making these Valentine’s Day Fortune Cookies! Once you get the hang of the folding and curling, they are very easy to make. 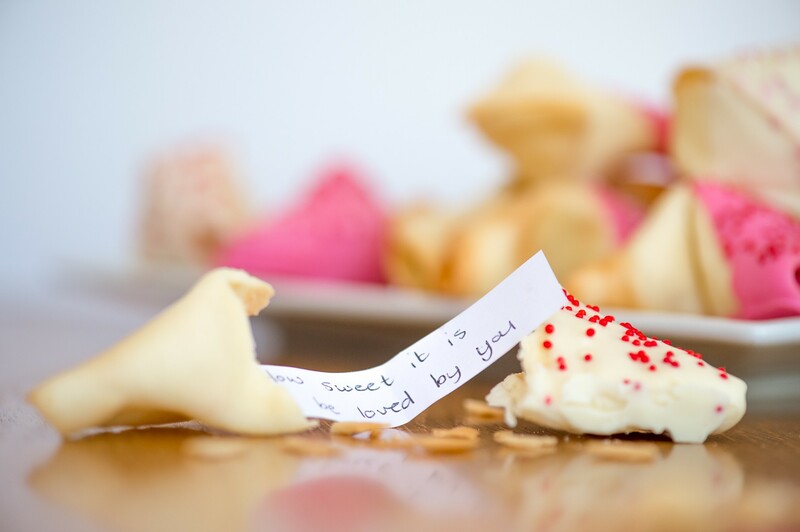 And you get to write your very own personal message for your loved one to receive as a sweet surprise! I used a good quality almond extract for the flavour and it really adds something special. The cookies actually taste great without the chocolate too, but in the spirit of Valentine’s Day I felt they needed a little “bling”! Cut out 20 strips of paper, 1,5cm x 6cm in size. Write messages of your choice onto the papers and fold each in half. Preheat your oven to 180°C. Line 2 baking trays with greaseproof paper. Draw 2 circles of 8-10cm’s diameter onto each piece of paper (use a mug or small bowl to trace around). Turn the paper upside down so that the pencil does not come into contact with the cookies. In a medium bowl, whisk together the egg whites, melted butter, water and almond extract. Add the castor sugar and whisk well. Sift together the flour, cornflour and salt, then add to the liquid mixture and beat until smooth. Take a tablespoon of mixture and spread it onto one of the circles, keeping it as neat and smooth as possible. Repeat with the other another tablepoon of mixture. Bake the cookies for 7-10 minutes, until the edges are just turning golden brown. Working quickly, cover one cookie with a clean tea towel. Use a palette knife to flip the other cookie over. 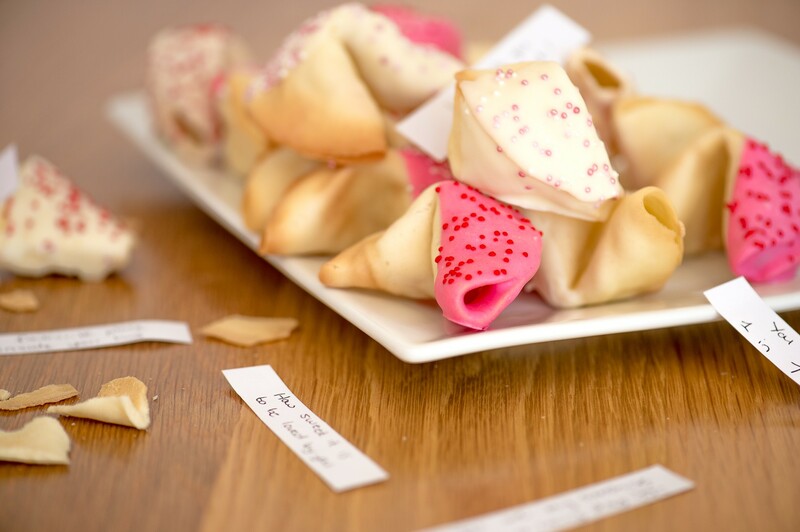 Place a message onto one half, then fold the other side of the cookie over to create a semi circle. Push the edges together gently to close, then place the cookie onto the rim of a glass or mug and push the ends down to bend the cookie in the middle. Hold for a few seconds, then place the cookie into the cup of a muffin tin to hold it’s shape until cool and crisp. 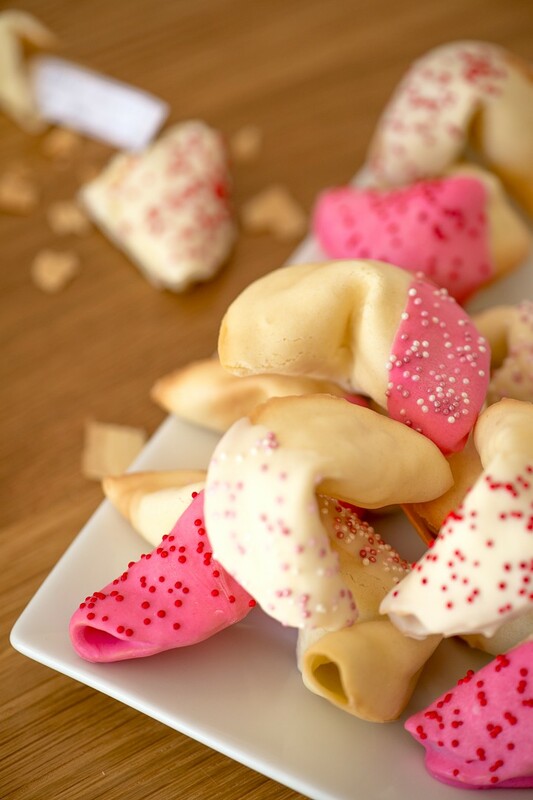 Now work on the other cookie, repeating the above step. Continue this until you have used up all of the batter. You need to work with the cookies while they are still warm! Once the cookies have cooled completely, melt the chocolate in the microwave at 30 seconds intervals (or over a double boiler). Divide the melted chocolate in two and colour one half with the pink food colouring powder. 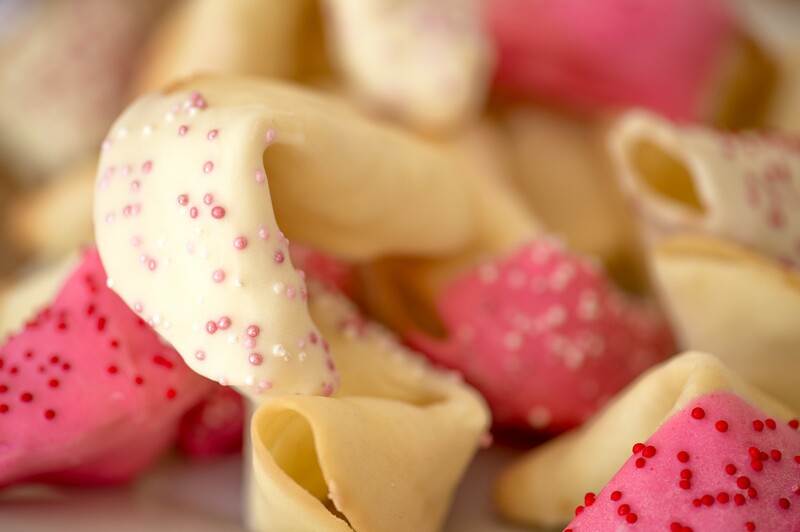 Dip one half of a fortune cookie into the chocolate, then decorate with sprinkles and set aside on a sheet of greaseproof paper to cool. Repeat with the remaining fortune cookies. As soon as the chocolate has set, store the cookies in an airtight container.